We’ve discussed FRTD for the majority of this week, beginning on Tuesday. As of yesterday, it has yet to disappoint. Should FRTD manage to hold support at or above the .015-mark, we like our odds of seeing further intraday bounce opportunities from this play. ERIE, PA, Feb 28, 2014 (Marketwired via COMTEX) — Fortitude (PINKSHEETS: FRTD) CEO Thomas J. Parilla today announces that the company has entered into a joint venture agreement to obtain the USA production/sales/distribution and licensing rights for a revolutionary medical marijuana product “MariMist” for the use in the care of cancer patients with MariMedical Pharmaceuticals (MMP), a privately held company. Additional clinical applications include the treatment of nausea, anxiety and pain relief. 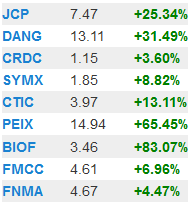 Yesterday’s Extended Watchlist looked like a sea of green, as you can see from this end-of-day snapshot of the stock tracker on our website. Every single play closed to the upside, with some making very impressive moves. BioFuel Energy Corp. BIOF & Pacific Ethanol, Inc. PEIX – These two ethanol favorites of ours have always tended to trend together, and sure enough, both had great sessions. BIOF opened at 2.10 and shot up like a rocket to a high of 4.10, a 95% move. PEIX saw a low of 11.10 before steadily increasing by 35% to a high of 15.02. Both BIOF and PEIX traded huge volume. E-Commerce China Dangdang, Inc. DANG - Ran 25% from 10.75 to 13.44 on record volume, to the tune of more than 10x its 3-month average. The earnings released yesterday alluded to the company turning a profit for the first time in years. The stock is currently up from yesterday’s close in pre-market trading. Leading up to yesterday, FRTD had already afforded us the opportunity to make up to 122% as we called out the stock on Tuesday and watched as it subsequently ran from .0081-.018. Ever since we brought PSID, an old favorite, back to the table in a report we published on February 18th, the stock has been creeping steadily higher each day. At the time of that initial alert, we observed a low of .0572. That places our total possible gain on this play at 92% as of yesterday’s high mark at .11. Take a look at the following chart we’ve annotated to highlight some of the key aspects of the chart. Conditions appear to suggest that a sustained uptrend could be in the cards. In the event that another consolidation period occurs we’d like to see support hold at or above the 200DMA. DELRAY BEACH, Fla., Feb. 26, 2014 (GLOBE NEWSWIRE) — PositiveID Corporation (“PositiveID” or “Company”) (PSID), a developer of biological threat detection and diagnostics solutions, today provided a review of its 2013 accomplishments and its outlook for 2014. February 15th marked the one year anniversary of PLUG appearing in our reports for the first time. We’ve continuously monitored this stock’s amazing progress, coming all the way from .1155, and continuously growing into the $4.00+ gem that you see today. If you take a look at the search results for PLUG in our archives, you can see that we’ve followed it every step of the way. You don’t need a calculator to tell how impressive the overall move from PLUG has been, but just for fun, let’s use ours: In one year’s time, PLUG has given us the gift of an absolutely unreal increase of 3,917% measuring from yesterday’s high of 4.64! We sincerely hope that our readers caught yesterday morning’s report, and read all the way through to the Extended Watchlist where we included FRTD as new cannabis momentum play. The head of steam that the stock began to build on the heels of a recent series of PR’s regarding the company’s entry into the trendy cannabis sector led to continued advances during yesterday’s session. FRTD is just the latest in the long line of companies we’ve seen take advantage of the hysterical nature of 2014′s “Green Rush”. While much of the initial fervor we witnessed in December and January has relaxed, don’t expect to stop hearing about this sector anytime soon. In fact, as more and more data comes in, we expect the marijuana business to grow exponentially as each state realizes the financial benefits and caves to economic pressure. This hypothesis was reinforced by the January tax numbers from Pueblo Country, CO (where the substance is now completely legal) came in. See THIS ARTICLE, which shows that based on their January tax income from marijuana sales, the county stands to increase their annual bugdet by nearly 5% Colorado is currently serving as an experimental template, and you can be sure that all across the nation, legislators and business people alike are watching intently. In other news, US banks are quickly clearing hurdles in the way of providing services to pot-related business, and the general sentiment in Washington, is to let this all play out naturally. Even the current administration has made statements which set the table for widespread marijuana reform. Several legislators have petitioned the president to reclassify marijuana, a relatively harmless substance when considering the fact that it now shares a classification with heroin and similarly dangerous drugs. While many obstacles remain to be navigated, the proverbial ball has begun rolling, and it seems now that there is little that can ultimately stand in the way of progress. ERIE, PA, Feb 24, 2014 (Marketwired via COMTEX) — Fortitude Group, Inc. (OTC: FRTD) CEO Thomas J. Parilla is pleased to announce that on February 22, 2014, the Company executed a Master Agent Agreement with eViteXchange.com. Under the terms of the agreement, Fortitude will offer and facilitate closed-loop transaction processing to legal dispensaries in the medical marijuana industry as well as provide processing for entities in states that have legalized recreational marijuana sales. Fortitude shall acquire from eViteXhange.com the URL’s 420banc.com and 420cashcard.com. Both domains will be used as a pre-paid platform allowing legal marijuana merchants customers to process purchase transactions using a debit card vs. cash. The private-label card will offer additional rewards and points to the card holders which can be custom designed to fit their individual likes and needs. Fortitude expects to derive approximately $155.00 annual profit per retail card user. The Company intends to launch on March 17, 2014. Be sure to stay tuned to our reports, and/or check our blog at BlueHorseshoeStocks.com regularly. We’re continuously tracking the cannabis sector as a whole, and often add new plays just like FRTD to the list. We had to do a quick update on PSID for our readers this afternoon. If you recall, we alerted this stock a week ago today, at which time we caught the stock at a low of .0572. Here we are, just five sessions later, and we’ve now seen a high of .095. That’s a big 66% gain in a relatively short time frame, congrats to anyone who has been following along with this play. We certainly hope that folks caught our mention of the BBRY $10 Calls this morning. We stated that they were “in line for a serious run-up” granted the premarket conditions of BBRY stock, and they couldn’t have behaved more predictably. Kicking things off today, let us take you through the timeline of TTDZ’s recent stellar performance. We first mentioned this stock on January 30th, at which time it was in the low sub-penny range, trading at .0012. We continued to follow TTDZ over the next week, during which time it ran as high as .0043, marking a gain of more than 250% to that point. TTDZ spent the next week consolidating down to a low of .0021 (02/14), and what it has done since that time is nothing short of astonishing. During yesterday’s trading session, the stock hit a high of .0132. That’s a whopping gain of 529% from its most recent swing low, and an overall move of 1000% from our original alert low less than one month ago! Yet another 10-bagger that we were thankfully able to deliver to our readers. 2014 is certainly making a strong case to be regarded as our best year ever, so if you’re just joining us, your timing is excellent. We had to take a minute to outline the BBRY 02/28 $10 Calls that we offered up as an options-trading idea last Thursday. You might recall on that day, we were afforded the chance at a 50% gain as those contracts ran from .12 to .18. On Friday, we saw a pullback in the value of those contracts to .08 as BBRY traded down, but yesterday, we received word that Ford was ditching Microsoft for Blackberry to provide software to run their in-vehicle “Sync Infotainment” technology. BBRY stock surged back, and the $10 Calls exploded to .37. That’s a positive move of 362% over a span of just a couple of sessions. We also saw a couple of subsequent swings that piled the potential for intraday gains even higher. After coming down to .21 into Monday’s close, the $10 Calls are looking like they are once again in line for a serious run-up, with BBRY trading as high as 10.52 in premarket trading today.